On April 4, 1967—exactly one year before his assassination—Dr. 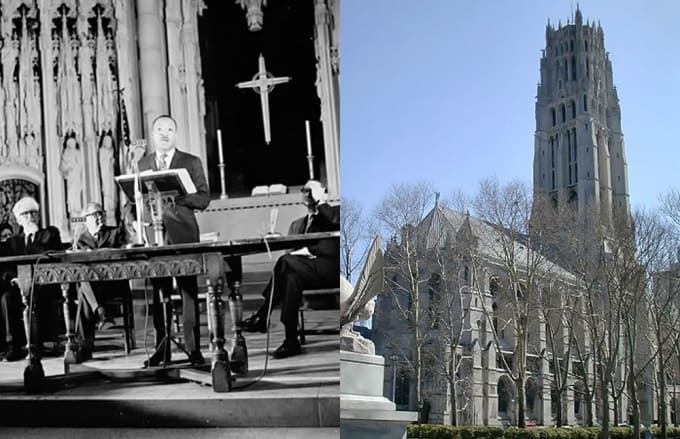 Martin Luther King, Jr. delivered the "Beyond Vietnam" speech at New York's Riverside Church. With the speech, King expressed his opposition to the Vietnam War, criticizing the United State's role in it as nothing more than colonialism. Furthermore, King questioned the morals of the U.S., calling the government the "greatest purveyor of violence in the world today." This was a bold move by King, as it cost him several allies, most notably President Lyndon B. Johnson. As the tallest church in the United States and the 24th tallest in the world, Riverside Church has played host to several key political moments. Nelson Mandela paid a visit to the church during his first trip to the United States following his release from prison. Fidel Castro appeared there during one of his ventures to the U.S., and United Nations Secretary-General Kofi Annan spoke there following the September 11th attacks. Because of its role in U.S. history, the church was named a New York City Landmark in 2000.